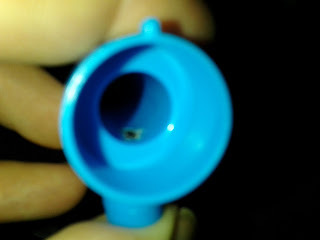 The main metal pin at the back of the slide can be punched out with a screwdriver and hammer, from the small side of the pin. 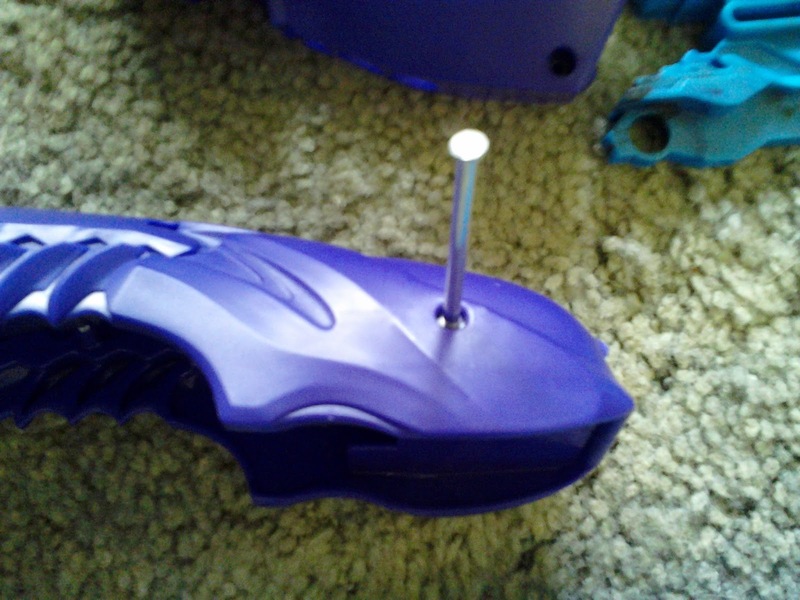 In addition, there are several metal pins connecting shell and slide halves. Carefully pry the pieces apart once all the screws have been removed, and eventually you'll get to the guts. After the dart is all the way in. The spring-loaded piece in the barrel pushes that long plastic piece forward just enough to give the trigger clearance for movement. 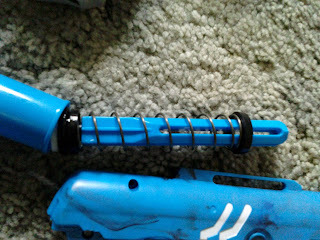 A closer look at that catch mechanism. 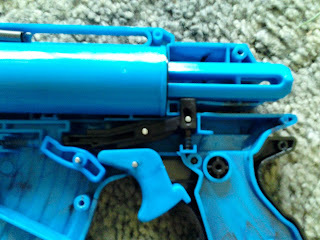 Due to the Plasma Pistol's shape, an extra lever was added in order to move the catch as intended. 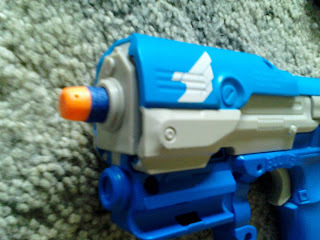 The trigger on the M6 sits farther forward, so the trigger itself can engage the catch. 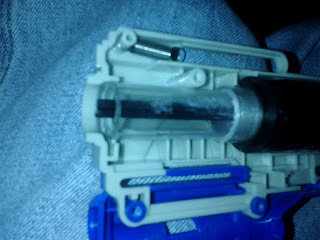 The plunger tube is just under an inch in diameter inside, with a decently strong spring within. In stock form, the pistols both sent Boomco darts 75' angled, and 40' flat. 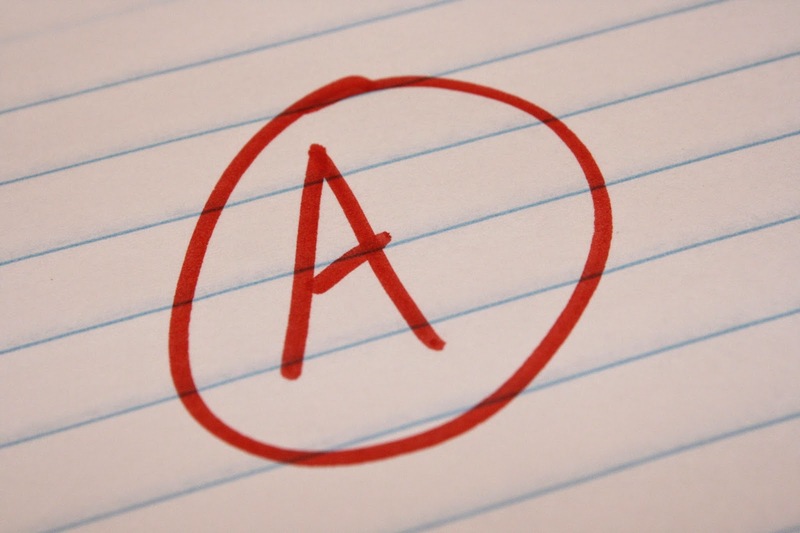 Your results may vary. For some basic mods! A 5/8" long spacer, of either 3/4" CPVC or PEX, will do for extra compression. If you have a cheaply acquired Farshot, you can harvest the spring out of that. I did the former. I also super-glued the plunger tube and its cap together to eliminate any leakage, and did the same with the dart barrels. 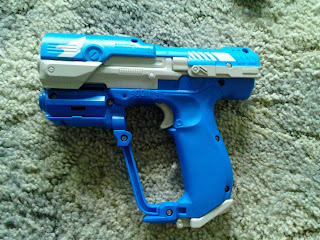 I kept the Plasma Pistol for use with Boomco darts, but disabled the dart safety. 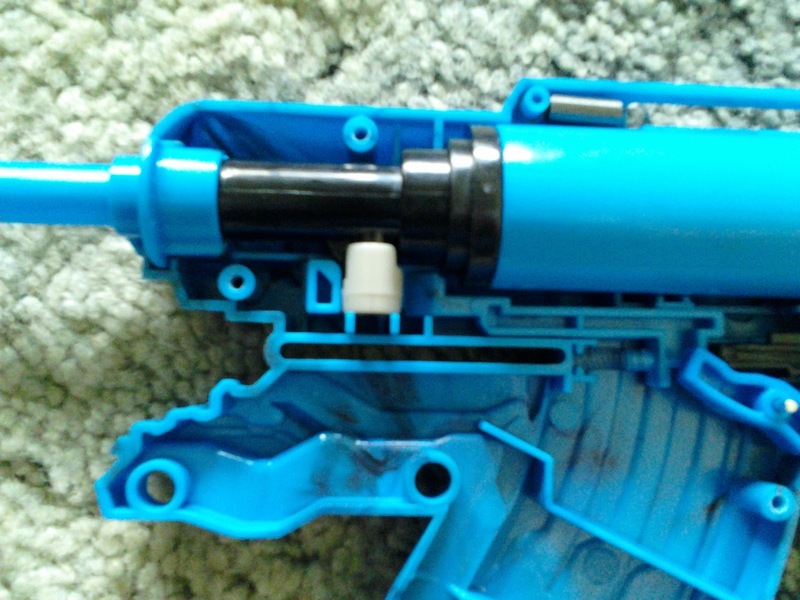 I simply shaved down the inside tab until it was flush with the rest of the barrel, and secured it with all-purpose ABS/PVC/CPVC cement. 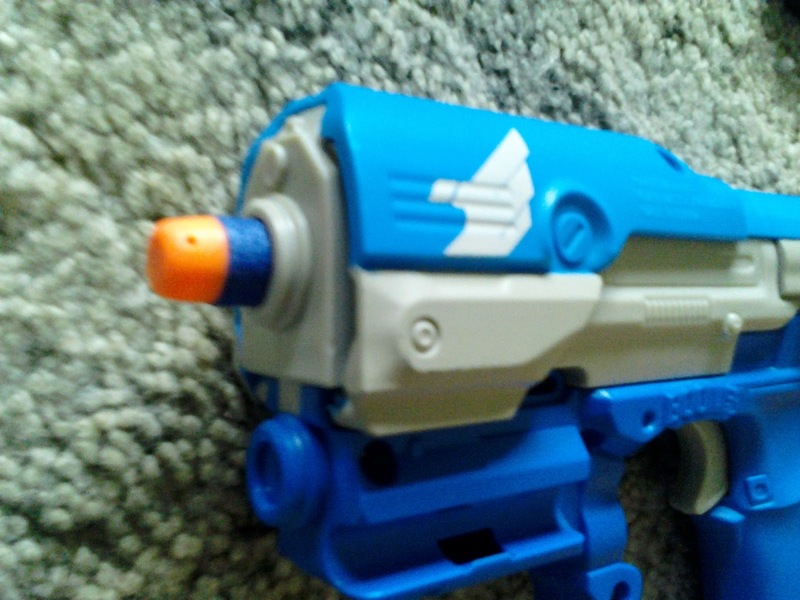 For the M6, I decided to adapt it for Nerf darts. The plunger tube cap, as it turns out, has a depression .75" in diameter. 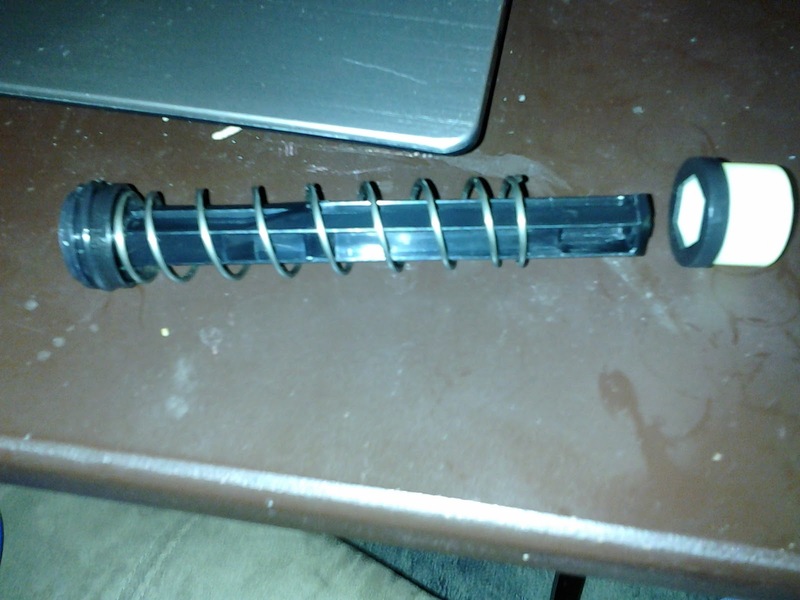 I glued a small length of 3/4" aluminum tubing in place, and a short length of 5/8" OD polyester tubing. 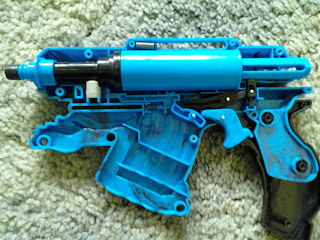 And I used a Dremel to quickly chew away at the shell to make room for my barrel. I kept the dart post in place. In both cases, I'm hitting 100' angled shots consistently, and 65-70' flat. 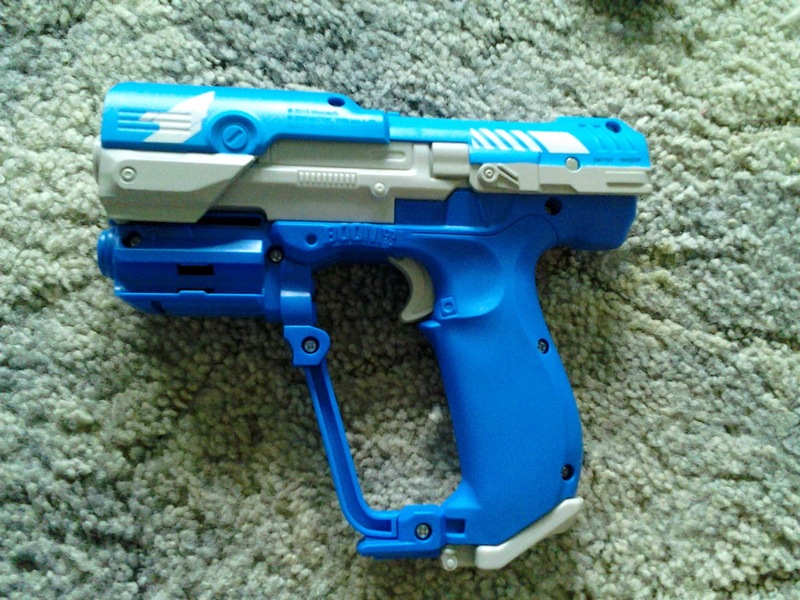 The Boomco darts have slightly less range, but are far more accurate than streamlines. That is to be expected. If you have yet to jump on the Boomco bandwagon, these blasters are a great place to start. My M6 has already seen plenty of abuse in the hands of a little kid at my last war, and is still in great operating condition. 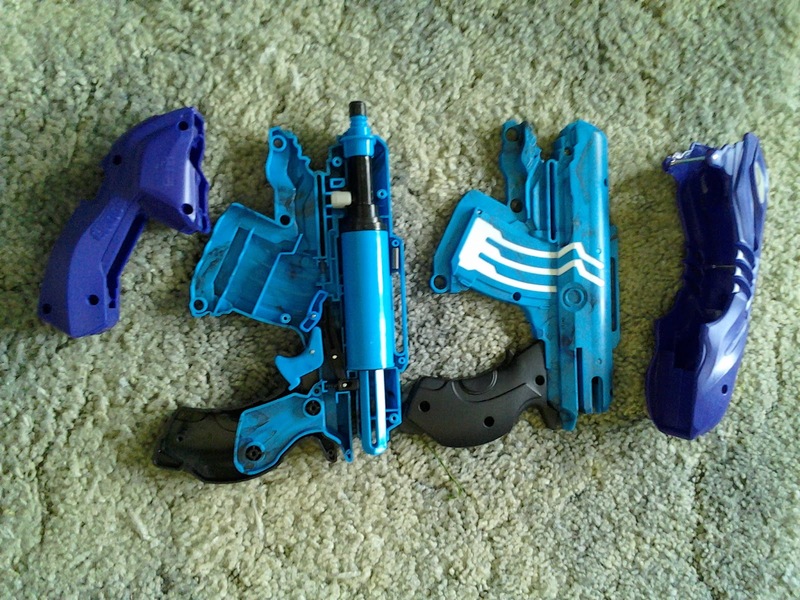 These blasters are solid and reliable, and are a must for your collection.